Each individual port on the cage provides up to 3 Amps of power. However, the back module of each cage can provide up to 7 Amps total between all ports while the top plate and top handle together can provide up to 8 Amps total between all ports. The baseplate that comes with each cage seems to fit onto smaller dovetails than the Arri standard size dovetails. What dovetail is it compatible with? The R/S button on the top handle is not triggering the camera. What’s wrong? 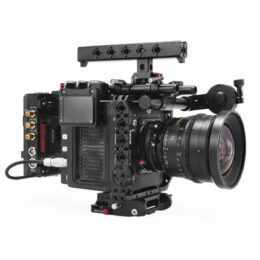 When I plug my monitor or wireless video transmitter into the HDMI port of the cage, the Red LCD/EVF display shuts down. Why is this? The run/stop functionality of my wooden handle or Nucleus-M hand unit/handgrips is not working with my Red DSMC2 camera. What do I do? I don’t want to buy an entire cage and just want the I/O module/top plate. Can I do this?